Windows 10 comes with redesigned start menu which provides users favourite start menu with addition of modern live tiles to get live updates from your favourite applications. 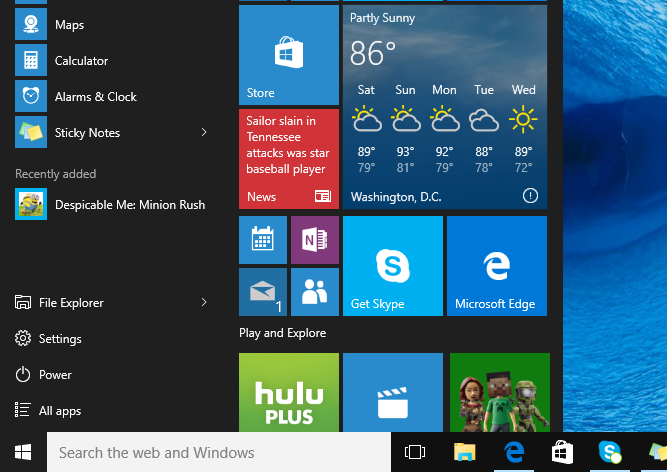 Windows 10 also provides many ways for users to customize start menu and live tiles as per their preferences. Users can pin new applications to Start menu, unpin applications from Start menu, create new application groups and move application live tiles among different groups, change live tile sizes, change color appearance of start menu, and many more.. Below are 11 different ways in which you can customize your Start Menu in Windows 10. You can resize your Windows 10 Start menu by holding down upper or right edge of Start menu, and dragging edge to change size of your Start menu horizontally or vertically. 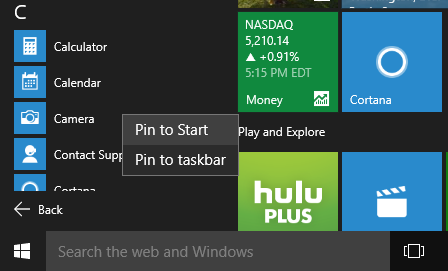 To pin application as live tile to Start menu, Click on "All apps" shortcut in start menu, locate and right click on application that you want to pin, and select "Pin to Start" in context menu. 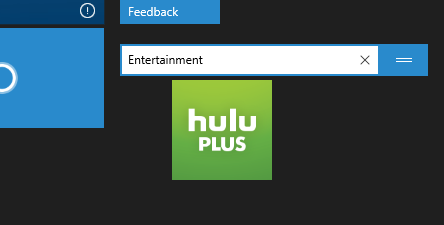 You can also pin applications from "Most used" or "Recently added" apps list in Start menu by right clicking them, and selecting "Pin to Start" in context menu. Right Click on application live tile in Start menu and select "Unpin from Start" to unpin application from Start menu. To create new group in Start menu, drag application live tile up or down in start menu live tiles area until group separator bar is visible. Drop live tile beyond group separator to create new group with dragged application's live tile in it. Click just above new created group to display name textbox and give name to your new application group. 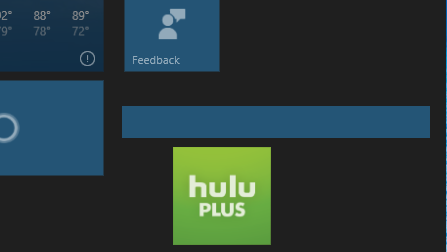 To delete application group, just move all application live tiles out from the group to be deleted. When application group doesn't have any application in it, it will be automatically deleted. You can move application live tile to different group by dragging live tile from one application group to another. Right click on application live tile, and go to Resize option in context menu. This will show you sub-menu where you can change your application live tile to small, medium, wide or large size. Right click on application live tile, and Select "Turn live tile off" to turn off live updates in application live tile. You can turn on live updates back by using same menu, and selecting "Turn live tile on". To pin your favourite application to taskbar, Click on "All apps" shortcut in Start menu, locate and right click on application that you want to pin, and select "Pin to taskbar". 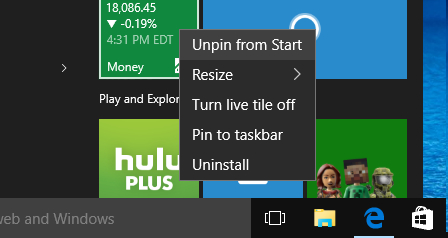 You can also pin applications from "Most used" or "Recent added" apps list in Start menu or from live tile in Start menu by right clicking them, and selecting "Pin to taskbar" in context menu. Windows 10 Start menu shows folder shortcuts for commonly used folders like File Explorer, Settings, etc.. You can customize folder shortcuts displayed in Start menu by adding your other favourite folders (like Documents or Pictures) to Start menu folder shortcuts. Follow How to add or remove folder shortcuts in Windows 10 Start menu for detailed steps for customizing folder shortcuts in Start menu. Windows 10 Shows your Most used apps and Recently installed apps in Start menu. You can customize this list or disable these apps from being displayed in Start menu by following the steps at How to hide most used and recently added apps from Windows 10 Start menu. Windows 10 also provides options to personalize your Start menu color to your preferences. Refer How to change start menu color in Windows 10 for detailed color customization options in Windows 10 Start menu. Windows 10 Start menu is beautiful with live tiles and provides you great customization options to personalize Start menu to your preferences!